So, you’ve chosen your lake, set aside the time, and decided you want to try your hand at ice fishing. I’ve found it to be a great way to relax and, once you’ve got the hang of it, it’s a rewarding way to earn your dinner. That said, it’s critical to do your research and make sure you’re all caught up with the best ice fishing house supplies that you will need. For me, proper equipment is necessary to enjoy the process, and enjoying it is essential to catch fish. Let’s see what’s out there. When I began to prepare for my first outing ice fishing, I was woefully unprepared. I thought a big jacket and four walls to block out the wind would keep me sufficiently warm. Little did I know that without an insulated seat, the ambient cold will get to you, one way or another, no matter how prepared you think you are. I’ve personally found that those two pieces of ice fishing house supplies to be the two most important when it comes to enjoying the experience. Many people swear by sitting on their bucket, but I say they’re crazy. Sitting for hours on something with minimal insulation is just a nightmare, and you lose a lot of body heat. Maybe they have better circulation than I do, but I don’t know if I’d still be ice fishing today without insulated chairs. 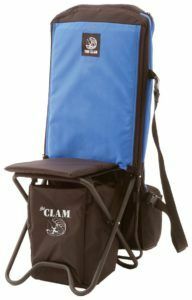 I’m a fan of the Clam® Chair, which you can get at any sporting goods store with ice fishing house supplies. In addition to a nice, warm seat, I find it necessary to have a good shelter for the long haul. Depending on your budget, there are a few approaches you could take. I must have seen re-purposed trailers a hundred times. That can be expensive and, if done wrong, disappointing and cold. One of the most important parts of being able to enjoy the experience is keeping yourself comfortable Staying out of the wind is crucial as well. Too many times I’ve seen big, do-it-yourself shelters that don’t get the job done. I imagine these people thinking they’re saving money, but it’s quite inexpensive to buy a shelter, there are some good ones on the market. For budget ice fishers, Cabela’s sporting goods sells a serviceable ice fishing shelter, and the brands Shappell and Frabill sell similarly priced shelters of similar quality for a price point of roughly 150-200 dollars. By this point, you’ve got an idea on how to manage the temperature and staying comfortable, but now it’s time to get down to business. Breaking the ice. First things first, you’re going to need an auger. The auger is one of the most fundamental pieces of ice fishing house supplies, hands down. I’ve heard of some awful ways people have tried to make a hole in the ice. But, anything but a specially designed piece of machinery is asking for trouble. If you’re not familiar with ice fishing, you might be asking what is an auger? A fair question, I was confused at first too. Despite the technical term, it’s mainly just a drill for the ice. I must advise against using anything else to break the ice. An auger is the safest way to get through the ice. That’s because it runs the least risk of cracking the ice, which is very dangerous. 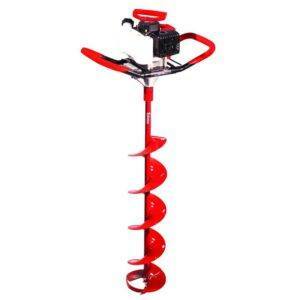 There are a few on the market at the moment, and I’ve had no problems with the cheaper ones, such as the Eskimo Hand Ice Auger (about $50) here in Wisconsin. That said, you may want to consider a gas-powered model, such as the Eskimo Sting Ray 33cc with 8″ Quantum Auger, running about $250 if you live further North, like Canada, where the ice tends to get thicker. But when it comes to augers, though, it’s better to be safe than sorry. If you’ve got the budget for it, it’s a smart move in the long-term to buy a heavy-duty auger that can last you for as long as you keep ice fishing. What sort of rod do I need to go ice fishing? Typically, in my experience, ice-fishing requires a rod a bit longer than I grew up with. Once I got used to it, though, the 24-40 inch rods started to make perfect sense. And I began to understand the specifics of hovering over a hole in the ice. For me, the various rods I’ve gotten over the years are some of my favorite ice fishing house supplies. In time, you too might have a whole slew of multiple rods for various purposes. So, now you know longer rods are generally more common in ice fishing. Now it’s time to think of the reel. Usually, ultralight reels are the go-to, and ice fishing specific models are much cheaper than their open water counterparts. When I go ice fishing, I try to stay modest concerning my catch. So I tend to be happy catching perch, crappie, and bluegill, which are relatively common prey when ice fishing. For these fish, I prefer inexpensive rods. I have enjoyed variously using my 13 Fishing brand Widow Maker Ice Rod. Also like my Frabill brand Straight Line 101, and my Cabala’s Tourney Trail® Ice Combos over the years. Now it’s time to put all these pieces of equipment to use! If it’s your first time using an auger, you might want to bring along someone who knows how to use it. It’s easily the most technical part of the whole process. With a little patience, you can figure it out on your own. Once you’ve got your hole and set up your shelter, you get to enjoy the relaxation. Depending on your luck, you may have either a productive first year or an educational one. Considering you’ve done your research on ice fishing house supplies, you can expect at least some success. In just a few seasons you’ll become a wise old fisherman, and you’ll be looking forward to every winter. That’s how I feel about it, and I hope you will too, it’s a great way to spend your winters. If you have any questions or comments feel free to leave them below. You can also email me directly cory@tackleboxtalk.com. Thanks for Reading and Happy Fishing. Previous Post Ice Fishing Crappie Jigs – Which Ones The Right One? 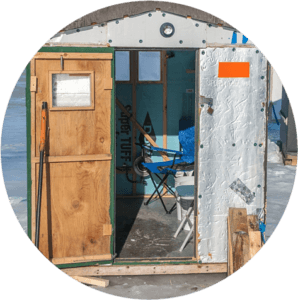 Next Post Clam Ice Fishing Houses – Serving Up Thermal On The Rocks! I have to say I was a bit disappointed that you didn’t link your site to a place I could look at the shelters. That was the part I was actually searching for. However, I didn’t even give a lot of thought to the chair, but I can definitely see where an insulated chair would really be a must-have. I’ve sat on cold surfaces for long periods, bleachers for an ice hockey game for example, and it was really a nightmare. My son has gone ice fishing several times with his Dad and loved it, and now he wants to get into it, so I was thinking of getting him a shelter for Christmas. You say Cabella’s has them? I’ll have to check it out. Great write-up. Thanks for the tip on the chair. I can only imagine how cold you must have been during your first ice fishing trip! While I hate the cold (I’m sure I mentioned this before) you do make it look appealing. I’d never heard of an auger. Are there different sizes to create a hole large enough for multiple people to fish from the same spot? Or is this an activity that people have to have their own spots for. I mean, would a bigger hole means the ice is more likely to crack or something? Most people just fish in their individual fishing holes. If your ice fishing for a large type fish like a musky or lake trout you want to drill two holes next to each other or you might lose the fish when it is coming out of the hole. You make ice house fishing sound like way less work and a lot more fun than I imagined. One thing I always wondered was, what do you wear? Does that make a difference in terms of your seat and structure? I’d love to read an article about personal gear, like footwear. You would want to dress in layers so you can take articles of clothing on and off as the temperature may vary depending on the level of activity you are doing. I plan on writing an article in the near future on clothing that you should wear while ice fishing. Hi Cory; I also learned something from this post. Even though I have read your story, In a bid not to misunderstand any thing in the post, may I ask,is the image that looks like a mini house a part of the Fishing gare? You have mentioned shelter. Is winter fishing something that you actually stay indoors to catch a fish? Using a drill means that the water surface is frozen? I see, that gives reasons for the fish to be at the battom of theLake. All of this sounds exciting. Sounds like something I would want to involve in doing. The image you are talking about is the ice house itself. You can fish in the ice house or outside but it’s much nicer being enclosed. Yes the water is frozen.